Can it Still be a Success without Cameras? There are publicity stunts, and photo opportunities. Events designed for maximum media coverage and events with a greater purpose, which the media might cover. Sometimes photographers and reporters will come out, but even if they don’t, is there enough meat to your happening to call it successful? Put another way, if a tree falls in a forest and a journalist doesn’t cover it, did it still fall? The answer, in every case, should be Yes! Sometimes, organizations stage events to mark significant milestones, to thank employees, or to engage the community. Healthcare organizations especially are steeped in the culture of giving back, educating their target customers, raising awareness, or raising funds for a new piece of equipment or new clinical service. These events may not always pay dividends with a picture in the paper or a story on the evening news, but if there’s an organic reason for hosting it in the first place, it can soften the blow of having no media attend. SPRYTE client Griswold Home Care, marking its 35th anniversary, chose to kick off a series of events throughout the year with a luncheon for employees and its network of caregivers, partners and vendors. 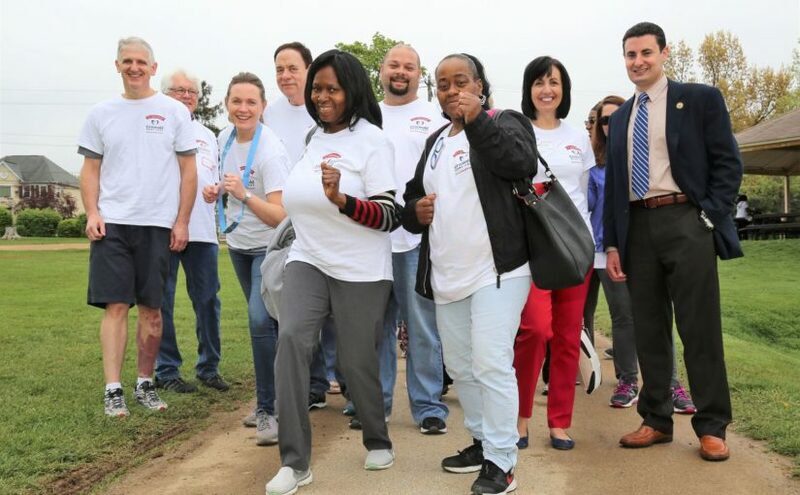 Lunch was followed with a group walk in a nearby park, with matching anniversary T-shirts and a raffle to benefit its nonprofit foundation, named for the company’s founder, Jean Griswold. Local elected officials were invited to attend, and the media were alerted. Materials noting the anniversary, including a press release and letter to the editor, were made available to its 200-plus franchise operators to use in their local territories. Even though no cameras showed for the walk, by all accounts the event was a rousing success. Caregivers felt appreciated, employees had a morale boost (and a break from their routine), and money was raised for the Griswold Foundation. Some lucky employees went back to the office with prizes, including a FitBit and gift cards. The company’s executives were thrilled to receive a proclamation saluting the anniversary, read in person by the county commissioner, and a handsome certificate noting the occasion from a U.S. senator. Both will be framed and hung in the office lobby. A local community paper committed to run some photos, and franchise-generated stories appeared in Florida and Delaware. Could this event have been more successful had a TV station shown up? Not if you ask the employees. Would its presence have been a bonus? Sure, but that wasn’t essential to what was conceived as a company celebration for employees and other internal audiences. What is the main purpose of this event, and who will it benefit? Is the event worth having and can it stand on its own even if no media show up? Can the content of the event be repurposed for internal or external use, like photos for an annual report, company newsletter, e-blast or social media? If you have a clear idea of what kind of event your healthcare organization wants to do and what the higher purpose is, and you execute it the best you can, it will be a success, whether media show up or not.